Thank you to everyone for helping! Special shoutouts to ES, Chalkbot, Largenuggets, Sogeking, Newport5000, Nothingtolose7 & MerliniX for providing deck lists. 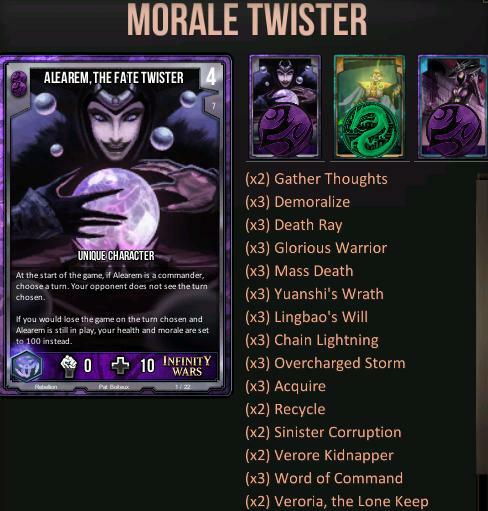 If you think you have a better version of any of the decks posted above, or you have a deck which you believe should featured on this list, let me know and I'll update it as soon as possible. I haven't played in a while but is it really worth splashing SOA just for bury malignant, tome and sufferer? I think a 2CoV DoD deck could do the acquire mill thing better and have an alternative morale wincon. If you're going for mill, I'd rather go with exiles for gather the weak, making rift more worth it. If you're going death blast, I'd def go soa for tome. Malignant looks like a totally fine upside. No WP/FD Extended Aggro? Its not T1, but I'd say its a solid T2 deck. Why there is no triple COV/GI decks? I was told they were popular. Well 3p Gi only gets access to Omnimind, omnitron, flux capacitor and Shield Generator. To use omnitron you have to build a deck around it and it gets countered to some degree by artifact destroying cards which isn't to bad in normal games but can be a problem in ranked games with a sideboard. And If you don't want to go the omnitron route the GI OS deck is basically a GI deck but the one purity of OS gives you access to boxes,cassial (can be a decent budget version for Martyr golem to combo with Unstable Bomb Bot although its a lot riskier), Harbinger of Law, Evict and consecration just to name a few and Omnimind and flux capacitor, while beeing decent, aren't worth sacrificing your boxes for. 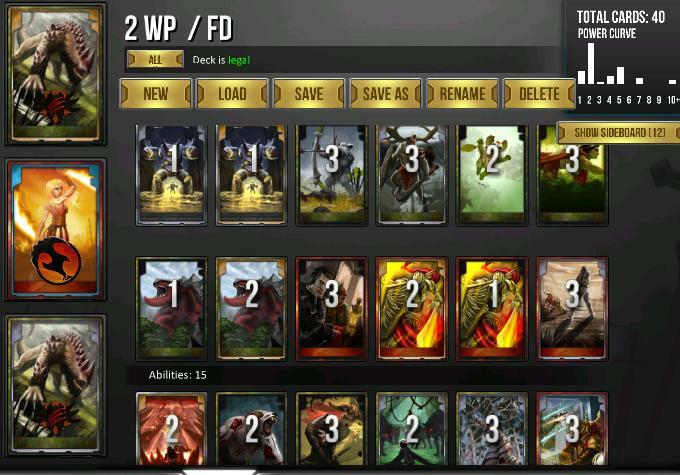 Any one of those cards is worth splashing SOA for in my opinion. Bury + Malignant is just an awesome combo, it's a 1 mana 9/10. You can theoretically get Malignant out on turn 2, although turn 3 is more realistic and happens quite regularly against Aggro decks. You never really want to pay full price for a Malignant, even from command, but with bury and blood arrows you can reliably have 2 or 3 Malignants in your graveyard in time for the heavy hitting turns (6/7/8) when Mass Death is active, it's when your first Tome will typically activate and also when you can spam multiple spells in one turn easily. Suddenly you can wipe the opponents board and build a substantial one of your own. Having Bury makes a massive difference here. Aleta just buys time, it discourages you opponent from attacking on turn 2 and provides an infinite army of chump blockers all game long. When turns 6/7/8 hit you can send all of these tokens into the assault zone. Tome is just amazing. Firstly it wipes the whole deployed area at once, which is great with malignants. It also fills up your graveyard, which synergises with aleta. But it's main use is in the late game, where you essentially play a tome every 3 turns, which makes attacking very awkward for your opponent. This buys you plenty of time to use Acquire and also synergises with Mass Death as your opponent is encouraged to attack in big waves. The other card you didn't touch on is Infest. 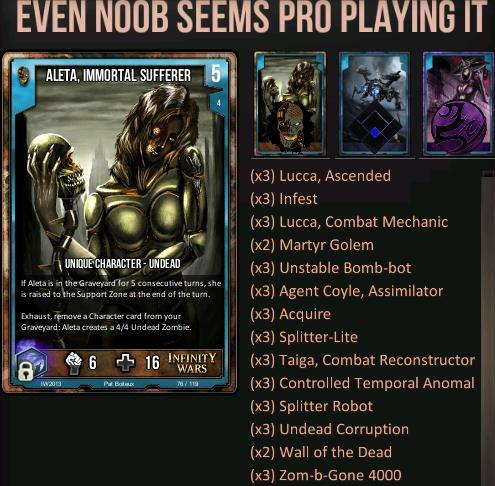 Infest basically sums up this whole deck, which is turning defense into attack. And it doesn't just spawn a 6/4, it's a 6/4 that revives itself every 3 turns, which is very useful in long drawn out games. The SOA cards essentially provide you with a cheap endless army of units, without saturating your deck with characters. Bury even helps unsaturate your deck. The endless army makes this one of the best decks in Mill mirror matchup, as you have an alternative win condition if you lose the 50/50 Acquire war. I haven't been able to build an effective COV DOD deck and I haven't seen a good list from anyone else. My variants have been too inconsistent against Aggro Decks and weak against Midrange Decks. I think the lack of pro-active plays really hurts COV DOD. But if you have an idea for a deck in mind I'll do some testing and potentially add it to the list. If you've got a good deck send it to me and I'll add it to the list. Nice!! Gonna check the list to see what I can build and modify! Okay, I had to post that because the other one is a disgusting abomination that I have long since discarded.